The Hegins-Hubley Authority was awarded much-needed funds by the Pennsylvania Infrastructure Investment Authority (PENNVEST). The authority was approved for a $2 million low-interest loan to fund the design, engineering and permitting phases of its Act 537 plan project to construct a conveyance and treatment system for the areas of Hegins and Hubley townships experiencing failure of on-lot septic systems. The proposed sewer system will consist of 166,610 feet of gravity sewer mains, 21,564 feet of low-pressure mains and seven pump stations. The wastewater treatment plant will have the capacity to treat 600,000 gallons per day. This funding will go a long way in helping to make needed improvements to better serve residents and protect the environment. It will also help businesses to grow and create a number of new jobs. Repealing that rule could lead to patients having to say goodbye to their physicians or patients having to drive farther for care. Additionally, recruiting physicians and specialist would be difficult, and medical innovations may be halted. You can watch the address on my website, RepTobash.com at 11:30 a.m. and keep your eyes on my social media for updates and reactions. This week at the state Capitol in Harrisburg, it was my honor to welcome Sgt. Mark Anthony Xavier Durick. Sgt. Durick was selected the 2018 Airman of the Year, Junior Non-Commission Officer of the Air National Guard. He and his family reside in the 125th District. 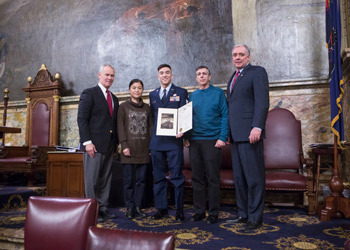 Pictured with Mark and me is (left) Speaker of the House Mike Turzai (R-Allegheny), Myoung Durick, and Major Mark Durick. I want to remind our local governments and recreation and conservation organizations that grant applications are now being accepted by the Department of Conservation and Natural Resources. Funded through DCNR’s Community Conservation Partnerships Program, grants benefit planning, acquisition, and development of public parks; recreation areas; motorized and non-motorized trails; river conservation and access; stream buffers; open space conservation; and regional and statewide partnerships to better develop and manage resources. The 2019 grant application round closes April 10. DCNR has scheduled a webinar for Wednesday, Feb. 27, from 10 to 11:30 a.m. to help potential applicants. The primary source of grant funding is the Keystone Fund, which has supported more than 300 trail projects, more than 2,400 community park development projects, and conserved more 117,400 acres throughout the Commonwealth. More information on the full range of DCNR grant opportunities is available here.